I would like to introduce you to the most surprisingly simple soup that will be your go-to when you want a warm and comforting bowl of healthy goodness. I have made this soup more time than I can count and each and every time it gets better. 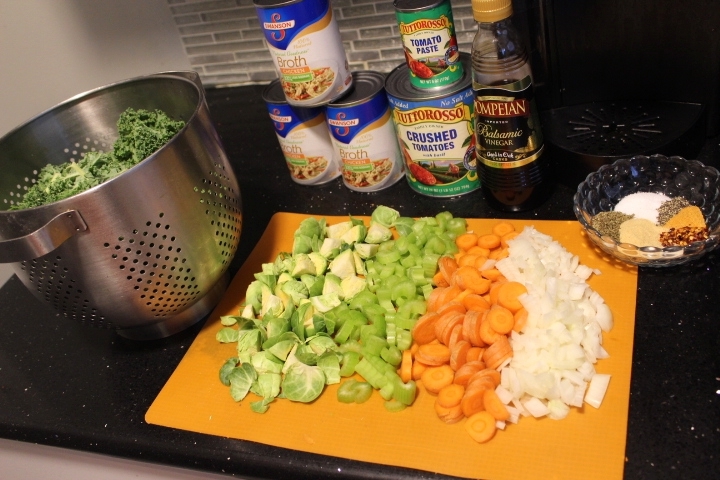 This is the soup I whip up when I need to get back on track with eating right. Sort of like my "reset" soup. It's packed with veggies and the seasonings are simple but significant. I always have these items on hand at home so preparing it is a breeze; which is key for me when I want to make my old faithful recipes. Kale is one of those magical ingredients that add texture and flavor to salads and soups. I love that it brings a heartiness to the soup and retains its texture even after reheating and enjoying the soup until it's gone. And believe me you are gonna want to slurp every drop. My sister makes it regularly as well and have always mentioned how this soup just gets better every single time she eats it! It comes together in about an hour, so if you have the ingredients on hand - get a big pot going and prepare to be satisfied!